Digital Signage for information display systems is used by the transportation industry. Flight Information Systems are used in airports to display flight information to passengers. 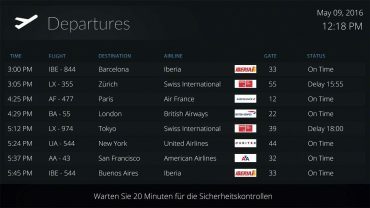 Digital displays communication have been used for years to inform about arrivals and departure flights in real-time. Displays are located inside and around airport terminals. Larger Airports enjoy personalized FIDS for each terminal or even for each major airline. FIDS are used to assist customers and people who are waiting to pick up passengers from airports. By extension, custom information display systems are running in many other transportation industries such as railways, cruise, city bus and subway. Trigger content is a QL Player API that supersedes predefined programs is used to alert travelers whenever an unexpected event occurs or based on GPS location. Broadcast live updates related to airlines latest schedules. Last-minute update delays and weather information. Communicate from a centralized location all displays remotely. Transmit emergency and warning messages immediately across the entire network.